Full kitchen. Jetted tub. Riverside King & Queen condo. 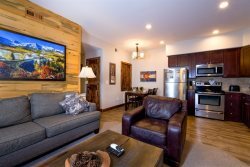 Our Lodging is Close to Rocky Mountain National Park and Walking Distance to Downtown Estes Park! A visit to Estes Park, Rocky Mountain National Park’s base camp, is the perfect place for all your adventures. Travelers can make the most of their lodging at Fall River Village with the best of both Estes Park and Rocky Mountain National Park. Loveland – Highway 34 is closed until Memorial Day, detour is through Longmont. Click here to see updates on any road closures. Longmont through Lyons – Highway 66 to Highway 36. You can check out road updates here. Address: 200 Filbey Court, Estes Park, CO 80517. Go west on Elkhorn Ave from the center of town. We are located just two blocks past all the shops on the right hand side. Or, as you enter town, from Highway 34, you can turn south onto Far View Drive or James St, then turn east (left) onto Elkhorn Ave. Shortly thereafter you will see Fall River Village on your left. The office is located in unit 200, right next to the flag pole.